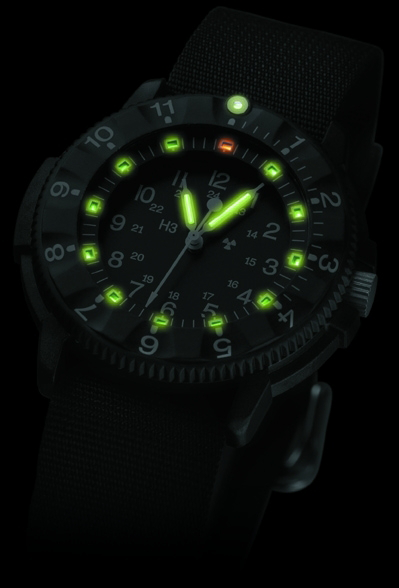 All traser H3 watches feature trigalight (tritium gaseous light) illumination technology. This highly specialised technology was developed by mb-microtec where a guaranteed light source was needed for safe operations in all hazardous environments and conditions. Trigalight are tiny glass vials that are laser sealed, internally coated with phosphorescent material and filled with a minute amount of tritium gas. Electrons emitted from the gas excite the phosphor to create the permanent light. They do not require any external power source or require recharging in order to glow continuously for up to 20 years. Trigalights can be manufactured in a variety of colours by using different phosphorescent material. Green is the preferred colour because it is perceived to be the brightest by the human eye but we also use Orange, Yellow and Blue. Blue is primarily used in watches for underwater use as it remains visible to the human eye for longer than any other colour. For more information on this unique technology, please visit the manufacturers website. The results, with the light intensity expressed in the unit "nanocandela" (ncd) are given below. The radio luminescent trigalight of the traser® watch remains constant, while the purely phosphorescent light of the SuperLumiNova may initially be brighter but diminishes within minutes and becomes progressively less luminous. If you need to read your watch at night, make sure it's a traser H3 with trigalight illumination.